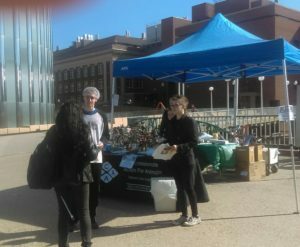 Students give away vegan food to interested passers-by. Help us distribute free vegan food samples at the University of Minnesota to show others just how tasty vegan food can be! We’ll be near the bridgehead on the East Bank. We need volunteers at various times from about 7am to 5pm that day. Sign up now! We especially need volunteers between 10am and 2pm, while the food is being distributed, but we could also use help before or after the event for setup or cleanup. You can RSVP on the Facebook event page and invite your friends to join us. Food giveaways are among our most fun and effective outreach programs. Check out the position descriptions below. If you’re interested in helping, sign up today. If you have questions, email Paige DiSpirito at page.dispirito@exploreveg.org.